He’s on a train back to Transylvania. Cheryl: Betty, it’s okay, it wasn’t Chic. Cheryl: Or he got away and he’s on a train back to Transylvania. Betty: I delivered to The Black Hood, Cheryl. That makes me a murder. I’ve been trying to prove my dad’s a killer, when really all I had to do was look in the mirror. Oh God! He got what he wanted. We’re the same. 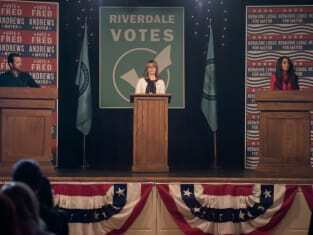 Riverdale Season 2 Episode 20: "Chapter Thirty-Three: Shadow of a Doubt"
Permalink: He’s on a train back to Transylvania. Hal: Penny for your thoughts, Hun? Betty: I was thinking he was a test. Betty: The imposter, Chic, everything that he did to us, brought to us, was kinda a test. But, we survived and we’re stronger for it. Alice: Well, that remains to be seen. Betty: No, Mom, we are. And we’ll survive whatever comes next. Permalink: We’ll survive whatever comes next.